The quilt on longer exists, just the label, but the quilt was squares of flannelette shirt material, velvets and woollen pieces. The backing was calico. 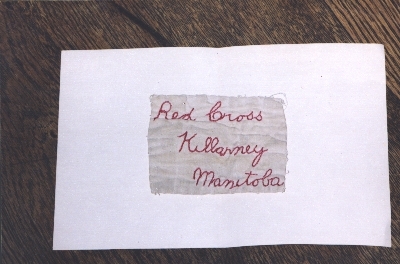 The label was sewn to the backing and it reads: 'Red Cross Killarney Manitoba'. It is embroidered in red and is on a white piece of sheeting. 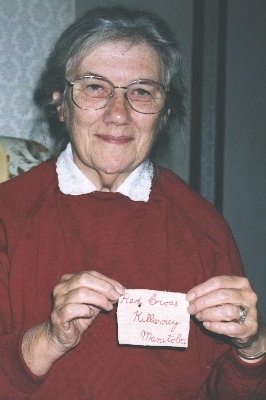 The quilt no longer exists but was made by the women of the Red Cross at Killarney, Manitoba, Canada and sent with other quilts to London for bomb victims. It was given to Mr. And Mrs. Fred Barnes when their house was bombed in 1940. In 1959 their daughter Win Adcock brought the quilt to Australia to Sarina in north Queensland. In the tropical climate the quilt only survived until the 70s except for the label. "Sometime between the 16 September and 9th October 1940 our first home was destroyed by a land mine (they floated down by 'parachute'). The blanket was given to my parents after this incident. The blanket had been well used either on the bed or over us in the air raid shelters. It survived the loss of our second home in Cambridge Grove that night in late 1944��"